Dental implants look, feel, and function like a natural tooth. Dental Implants replace the natural tooth root to provide support, stability and improve aesthetics. Plus, dental Implants can drastically improve your appearance. And don't worry because you will still be able to enjoy all of your favorite foods! If you've experienced the loss of a tooth due to dental decay or trauma, you understand the negative effects it causes your confidence. The good news is NELA Dental provides a permanent tooth replacement option which dramatically improves your appearance and function by using high-quality modern treatments. Beyond aesthetic concerns, though, missing teeth also affect your oral health. Missing teeth can cause tooth alignment issues and deterioration of the jaw bone. Dental implants addresses these problems and have been used safely for many years with beautiful results. Our doctors at NELA Dental are sensitive to the problems experienced by patients with missing teeth, and our goal is to protect your oral health, restore your beautiful smile, and enhance your self confidence. Why Choose NELA Dental for your Dental Implants? At NELA Dental we provide the latest in dental implant practices and pride ourselves with our experienced staff. Dr. Vance Costello received his doctorate from LSU School of Dentistry and is a member of American Academy of Implant Dentistry, Academy of General Dentistry, American Dental Association, and Northeast Louisiana Dental Association. 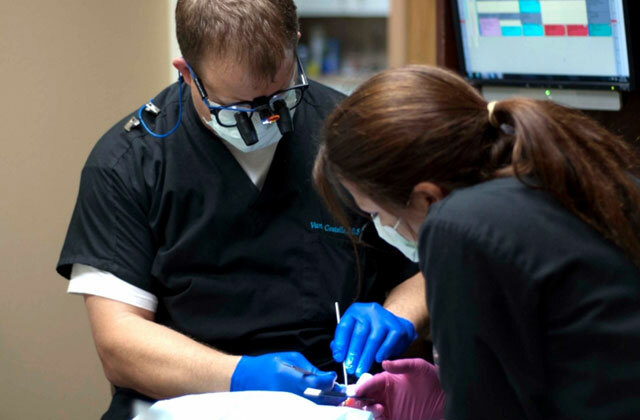 In 2011, he was awarded board certification and Associate Fellowship in Implant Dentistry by the AAID. Also, he is an instructor for "Implant Know-How's" advanced surgery clinic in Puebla, MX. The actual implant portion is made of titanium; a stable, biocompatible material that fuses with surrounding bone and tissue and becomes a part of the jaw bone. Once the implant has fully integrated with the jaw, the abutment portion is affixed to retain the dental restoration. The benefit of a dental implant is that it fills the space left by the missing root and provides a stable and durable base for a dental restoration. Dental implants placed at our offices also prevent deterioration of the jaw bone, keep surrounding teeth from shifting, and eliminate the sunken appearance left by a missing tooth. When finished with a dental crown, dental implants work like a natural replacement for one or more missing teeth. Denture-wearers also enjoy the benefits of dental implants. Dentures can be held in place with dental implants for stability and provide the wearer with added comfort. While dental implants are becoming the tooth replacement method of choice for many dentists and patients, fixed dental bridges are also another very effective solution. The purpose of a dental bridge is to fill the space left by a missing tooth. If you would like to restore the appearance of your beautiful smile and protect your oral health with dental implants, we would be happy to arrange a FREE consultation. We are proud to offer personal care that is customized to fit your individual needs. We also accept most major dental insurance plans, third-party payments, and offer flexible financing options. Please contact us for more information. We will take the necessary time to help you decide if an implant or bridge is the best option for your unique situation.